Sharp 90-degree inset walls add to the Lyra’s monolithic concrete design. Outdoor living spaces are no longer a simple trend in the industry—they’re part of a lifestyle. Eldorado Artisan Fire Bowls provide an outdoor retreat for the home, filled with a warm ambiance. Eldorado Stone, manufacturer of the world’s most believable architectural stone products, debuts six all-new fire bowls as part of the Eldorado Artisan Fire Bowls collection. Homeowners and designers now have the opportunity to create an elegant outdoor atmosphere with fire bowls that bridge rustic and polished design to create a beautiful, one-of-a-kind aesthetic. 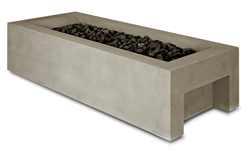 “Our new fire bowls add a warm modern sensibility to any outdoor space,” said Ramsay Hawfield, Vice President of Marketing and Product Development at Eldorado Stone. “Outdoor living spaces are no longer a simple trend in the industry—they’re part of a lifestyle. Eldorado Artisan Fire Bowls provide an outdoor retreat for the home, filled with a warm ambiance." Each of the handcrafted fire bowls display subtle variations in color and texture similar to natural limestone and offer a distinctive, unique piece for every home. Equipped with high-performance brass burners, Eldorado Artisan Fire Bowls provide an extended burning time with a 10-year warranty, despite the one-year industry standard. The new collection includes the Lyra Artisan Fire Bowl, exuding a modern linear design with a gently sloped fire feature, and the Equa Artisan Fire Bowl, a modest option for smaller patios or balconies. All Eldorado Artisan Fire Bowls include four color options—Black Sand, Oak Barrel, Aged Teak and Oyster Shell—in either honed or travertine finishes. More information about Eldorado Artisan Fire Bowls can be found on the newly redesigned Eldorado Stone website at eldoradostone.com.